Video from Good Day LA: Good Day LA interview video. Los Angeles – Singer and guitarist Donovan, and his son-in-law Ben Lee… who is an award-winning musician and actor… have teamed up with other artists, including Tom Waits, Iggy Pop, and Peter Gabriel for David Lynch’s Download for Good charity compilation. The 33-track album is available exclusively on iTunes and all the proceeds from the downloads go directly to the David Lynch Foundation, a non-profit organization which brings the Transcendental Meditation technique to underserved populations. 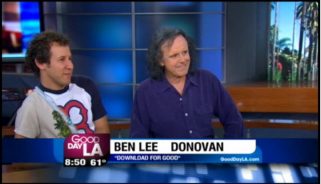 On Wednesday, both Donovan and Ben talked to us live on GDLA about their involvement with the project. This entry was posted on October 5, 2011 at 9:51 pm and is filed under David Lynch Foundation, Music, Videos. You can follow any responses to this entry through the RSS 2.0 feed. You can leave a response, or trackback from your own site.